In our review of the Mac mini, we mentioned that we would take a closer look at iMovie HD in a later article, and although iMovie isn't totally related to using the mini as a HTPC, this is the best place that we could find to put our iMovie HD thoughts. For the most part, "user friendly" video editing software is pretty horrible. The interfaces are overly simplified to the point that it's hard to actually get any good editing work done. I'll touch on the performance aspects of them shortly, but needless to say, I'm not a fan of cheap, entry-level, video editing packages. 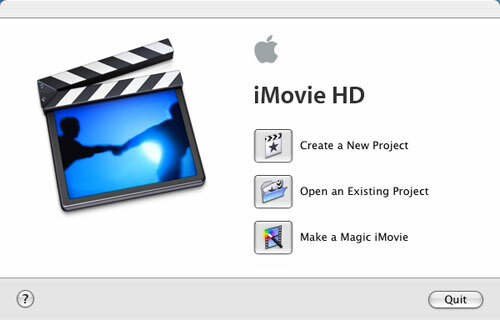 Being a part of iLife '05, which is priced at $79, meant that iMovie HD would inevitably fall into the category of a "cheap" video editing package, but as you can expect, the interface doesn't suffer the fate of other similarly-priced applications. The interface is relatively simple, content is on the right side of the window, your preview window is on the left, and underneath, you have your timeline. In terms of the organization of the interface, everything is where you'd expect it to be from a non-linear editing (NLE) program. What I found most interesting was that despite the relative simplicity of the interface, iMovie HD just didn't seem like an OS X program developed by Apple. I look at things like Mail, TextEdit or even Pages, and they all have a certain feel to them and flexibility in their UI that makes them distinctly Apple. I did not get that same feeling from iMovie HD. And although most were, not all features were totally intuitive on how to implement them, which is a bit disappointing from a UI standpoint. Given that many AnandTech readers have been using iMovie for much longer, I'm curious as to how Mac users in general view the iMovie UI, not from the perspective of NLE applications, but compared to all of Apple's applications. It's tough to pinpoint exactly what about iMovie HD that makes it feel so different than the majority of iLife or other OS X applications, but to me, it just did. Part of it may be that while OS X itself as an OS seems so much of an improvement, interface-wise, over anything else out there, you tend to expect similarly impressive UIs from all of its applications (at least those that are developed by Apple). While you can argue that elements of iPhoto 05's UI are similarly perfect, it's tough to do the same about iMovie HD (or even Pages). With that out of the way, let's talk a bit about how iMovie HD works. As its name implies, iMovie HD has the ability to import and edit, natively, content from HD DV cameras. Unfortunately, we didn't have any HD cameras on hand to test its HD functionality, but feature-wise, it should be similar to what we've experienced with editing standard definition video content. The most important feature of iMovie HD is native support for a number of storage formats: DV, 16:9 DV, HD, MPEG-4 and iSight. The beauty of native support for these formats is that there's no transcoding when importing video from a camera that stores content in one of the supported formats - it all happens in real time. For example, for our tests, we used a Panasonic GS-120 miniDV camcorder, which stores all of its content in a standard DV format. 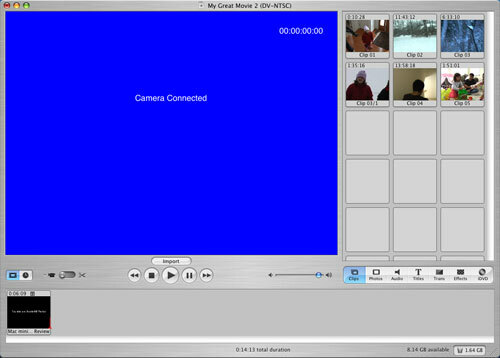 To import from our miniDV camcorder into iMovie HD, we simply connected the camcorder to the Mac mini by way of a 4-pin to 6-pin FireWire cable, and the mini had no problem detecting the camcorder. We couldn't use the camcorder's "PC Transfer mode", but leaving it in playback mode worked just fine. Just about any camcorder with a FireWire port should work, although Apple does provide a list of supported devices on their website. iMovie HD took care of the rest. It rewound the miniDV tape that was in the camcorder and started to play it from the start of the tape - immediately transferring the contents to the mini. Since there's no transcoding involved, the transfer wasn't very CPU intensive and it happened in real time, meaning that for every 1 minute of video, it takes 1 minute to import it. The application also attempts to separate clips for you automatically by importing each period of recorded video between stops as a separate clip and dumping them into your clips library. The idea behind this is that everytime you stop recording on the camcorder, you are done with that particular scene and you'd like it to be treated as a separate clip. For most types of editing, this assumption works quite well. There is even an option that will automatically take all of the clips on your camcorder, insert transitions between them, and put a title screen at the beginning of the whole thing, if you don't wish to do any sort of editing. You can also import other types of video, provided that you have the appropriate codecs on your computer. 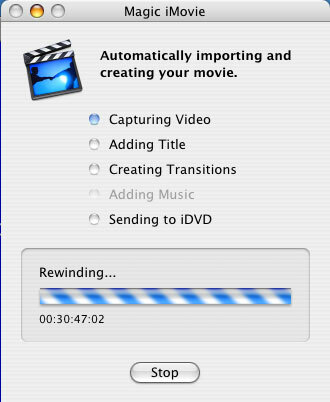 As I alluded to in the Mac mini review, importing non-native video does take a good amount of time, but it is possible. The rest of the features of iMovie HD are pretty standard for any NLE application. 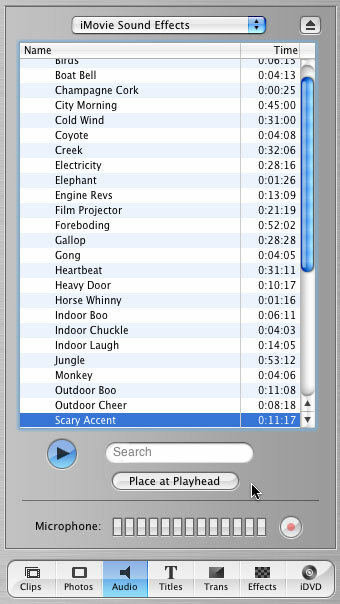 There is a surprisingly complete list of sound effects that comes with iMovie HD, and obviously, the iTunes integrated aspects let you import your iTunes songs as soundtracks for your movie. One complaint about the performance of the Mac mini is that extracting audio from an imported video clip takes a good amount of time (splitting the video and audio tracks up so they can be manipulated individually). You can apply a number of effects to video clips, although it's nothing that will be putting ILM out of business anytime soon. Applying effects is definitely CPU bound on the G4. If there's one area where you'd see a big difference between the 1.42GHz and the 1.25GHz models, it's in iMovie video effects. Thankfully, the application doesn't lock up when you're applying an effect to a long movie clip (which you won't usually do anyways) and you can actually multitask fairly well, even with the operation eating up close to 100% of your CPU. Note that this is on the 1.25GHz mini, so if you have a faster version or if you happen to be running on a dual G5, the experience should be even better. 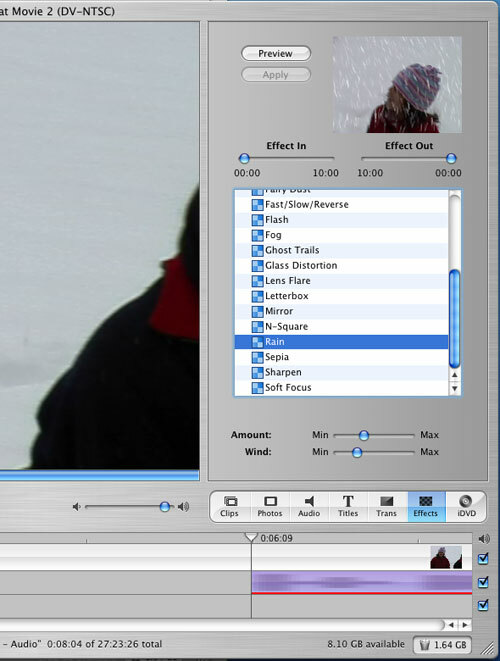 iMovie HD’s effects panel. Also note that while we’re browsing effects, we have a filter being applied to the audio waveform in purple. In order to keep the system as responsive as possible, the waveforms will come into focus (they are blurry now) shortly after they’re loaded. The editing power of iMovie HD is pretty decent, especially for a low cost application. You can perform all of the basic types of edits; cutting and pasting is equally easy, although for first time users, getting used to how to select portions of your clips to copy/cut/paste can be a bit foreign. iMovie also features its own trash bin, separate from OS X's trash, so that anything you delete can be emptied/recovered separately from your system-wide trash. I wasn't totally impressed with iMovie's handling of titling effects, as they often times reduced the image quality of the scene to which they were applied (depending on the title effect used). The application of titles to movie scenes was also not the most intuitive. 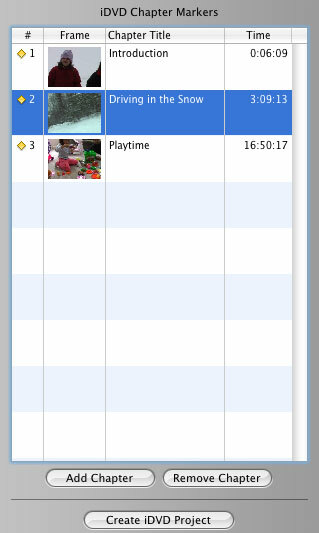 Quite possibly the most impressive part of the whole iMovie HD experience is the responsiveness of the application. Regardless of what you're doing, the application remains just as responsive as if you were doing nothing. It boils down to the thread management of the OS and application, as well as how iMovie handles the UI when other things are going on. For example, if you're applying an effect to a portion of a clip and decide that you want to preview another clip, it will momentarily pause the effect rendering while you perform other tasks. Armed with 512MB of memory, the performance of iMovie HD on the Mac mini was more than acceptable, surprisingly enough, even while actually editing and multitasking. 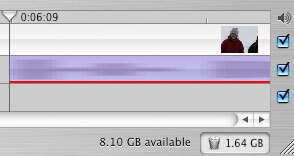 The red bar in the timeline indicates the progress of an effect being rendered. iMovie HD will seamlessly pause and resume the rendering when the user needs to do other things with the video project, never bogging down the system. Furthering its tight integration with the rest of the iLife suite, iMovie HD also makes it easy to export your finished movie to iDVD for full DVD authoring. 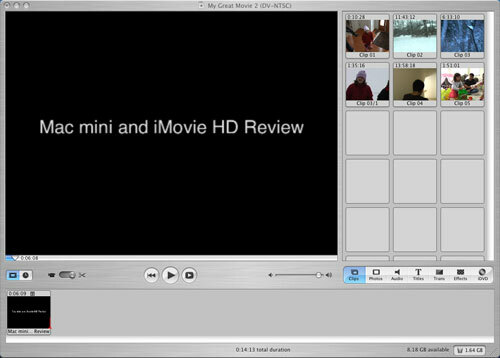 All in all, I was pretty impressed with the performance of iMovie HD on the Mac mini. Not bad for a $499 computer - it didn't feel slow at all. This was an excellent read. Regarding playback of HDTV Mpeg-2 streams, El Gato's EyeTV software for their EyeTV PVR products is currently far and away the best performer. The software is a free download from their site, and doesnt require you to own one of their PVRs. "The result is that playing a DVD eats up between 40% - 60% of the 1.25GHz G4 in the Mac mini..."
This and the visual problems are huge fallbacks as DVD and mp4 playback likely one of the best uses for a mac mini. Granted, not including certain HTPC features (digital audio, CATV in) shows that Apple isn't necessarily orienting this towards such users, but I have a number of friends who plan on purchasing this specifically for this purpose - DVD player, Internet on TV, etc. IMHO, this issue alone makes mini-itx desktop-based systems a much more usable alternative. They haven't quite reached the size, but I think they're well within an inch or two. What about the new Myth TV port for Mac OS X. I know it just came out probably too late for this article, but it is VERY interesting. It doesn't make the Mac Mini an HTPC by itself (the mac mini actually only acts as a front end with a "server" on the network to do all the recording). This actually makes the mac mini even more interesting to me, as per I can build a cheap and basic pc with as many tv cards and storage as I want that could be built from the many parts I have sitting around my house (and be as loud as I want because it isn't in my living room) and have the mac mini in my living room (attractive and quiet) actually playing the content. As for deinterlacing... Well, that shouldn't be a problem if you are connecting to a TV which will render the fields as single frames (as all TVs do, except some new TFT and plasma screens). I'm quite surprised you didn't even try testing how the Mac mini handles different Mpeg 4 video codecs, diffrent audio codecs, different subtitle formats, etc. basicly how it plays "DivXs". With there still not being a perfect set top Divx player I guess I was hoping a MAC mini could serve as one. I also missed any mention of how to connect a mini to a SD TV. We have said here under comments, that there is a DVI->S-VIDEO adapter available for MACs, but I think you should make note of it in your article since I'm sure many don't read the comments section or at least not all of them. First off, they neglected to mention the largest thing that keeps the mini from being an acceptable HTPC: Lack of a digital audio output. If you want to watch your movies in stereo audio, great, but thats only half the experience that DVD offers.
" had phone calls and emails from reporters and other news writers asking me if the mini was a threat to the PC"
Apple is innovative no doubt about it, but if the Mini works for Apple then dozens of PC clones will come out with thier own PC Minis negating the threat. I kinda feel sorry for Apple sometimes. Always breaching new ground with innovative products only to be copied. IPOD, IMAC are other instances of that.